What is emphysema and chronic bronchitis? What happens with emphysema and chronic bronchitis and colds? Why should I take colds seriously with emphysema or chronic bronchitis? Which cold treatment should I use with emphysema or chronic bronchitis? Can I prevent colds if I have emphysema or chronic bronchitis? If you have emphysema or chronic bronchitis, you know how miserable it feels when you catch a cold. After all, breathing is difficult enough with a chronic obstructive pulmonary disease (COPD). Not only does catching a cold worsen your ability to breathe and be active, but the cold virus increases your chance of getting a more serious respiratory tract infection. Here's what you must know to stay well. Emphysema and chronic bronchitis are chronic (long-term) lung diseases that make it hard to breathe. Both diseases are chronic obstructive pulmonary diseases (COPD), meaning they are conditions that cause a limitation in airflow. Emphysema and chronic bronchitis can occur separately or together and are usually the result of cigarette smoking. In addition, although it happens rarely, a genetic form of emphysema can occur early in adulthood, even if you never smoked. In the United States, COPD is vastly under diagnosed. While only 15 to 20 percent of smokers are diagnosed with COPD, experts believe the majority of smokers develop some degree of airflow obstruction. Emphysema comes on gradually after years of exposure to irritants such as cigarette smoke. With emphysema, the tiny air sacs in the lungs become damaged. Because the tiny sacs lose their "stretch," less air gets in and out of the lungs. This causes you to feel short of breath. With chronic bronchitis, the airways that carry air to the lungs are inflamed and produce a lot of mucus. The mucus and inflammation cause the airways to narrow or become obstructed, making it difficult to breathe. Once the airways are irritated over a long period, the lining of the airways becomes thickened. This thickening of the airways results in an irritating cough, hampered airflow, and lung scarring. The damaged airways then become a breeding place for bacterial infections such as pneumonia. Catching a cold with emphysema or chronic bronchitis may also lead to bacterial infections such as pneumonia. This occurs because of the airway obstruction and the inability to cough out infected secretions of mucus. Sometimes, patients with COPD are hospitalized because of a respiratory infection and the worsening of their symptoms. Treatment may include inhaled medications, oxygen, and antibiotics to treat any bacterial infection. Antibiotics do not treat a cold. To avoid more serious problems with emphysema, chronic bronchitis, and colds, it's important to always alert your doctor if your cold symptoms get worse. Don't wait until you have more serious breathing problems to contact your doctor. First, it is important to stay on your prescribed medications for emphysema and chronic bronchitis. Then, to decide how to treat cold symptoms, it's best to talk with your doctor. You might treat the body aches and fever associated with a cold with acetaminophen or ibuprofen. In addition, you should avoid antihistamines that thicken mucus and make it even more difficult to cough up. Most over-the-counter cold remedies are generally safe for people with emphysema and chronic bronchitis. However, decongestants raise blood pressure and some of the medications used to treat emphysema and chronic bronchitis also raise heart rate. So, use decongestants with caution. Again, ask your doctor about medications for cold symptoms. Good hygiene can decrease respiratory infections such as colds. Prevent the spread of a cold virus by making sure you and your family members wash your hands regularly. Check with your doctor about a pneumonia and influenza vaccine. You need a flu shot every year. One pneumonia shot is usually enough to protect you from a specific type of bacterial pneumonia. Avoid crowds during cold and flu season, since colds and flu can cause serious problems for people with COPD. Pay attention to healthy lifestyle habits by avoiding cigarette smoke and air pollutants; eating a balanced, healthy diet; and exercising to stay strong. Sinus infections can trigger breathing problems for those with emphysema and chronic bronchitis. Be aware of your sinus symptoms and report them immediately to your doctor to prevent worsening of breathing difficulties. SOURCES: American Lung Association: Need Help For Treatment Decisions with COPD? American Lung Association: Chronic Obstructive Pulmonary Disease (COPD) Fact Sheet. The National Heart Lung and Blood Institute: COPD: Learn to Breathe Better. Global Initiative for Chronic Obstructive Lung Disease (GOLD): GOLD Guidelines At-A-Glance Desk Reference. ©2007 WebMD, Inc. All rights reserved. Which foods can help patients with COPD? Which foods to avoid for COPD? Boost your energy and combat COPD with these diet tips. If you have emphysema or chronic bronchitis, please describe what it's like when you come down with a cold. What kinds of treatment, medications, or therapy help when you have a cold virus? As a patient with emphysema or chronic bronchitis, how do you try to prevent colds or flu? Is bronchitis contagious? Learn about bronchitis, an inflammation of the lining of the lungs. Bronchitis can be aggravated from colds, cigarette smoking, COPD, and other lung conditions. Explore bronchitis symptoms and treatments. Chronic rhinitis and post-nasal drip symptoms include an itchy, runny nose, sneezing, itchy ears, eyes, and throat. Seasonal allergic rhinitis (also called hay fever) usually is caused by pollen in the air. Perennial allergic rhinitis is a type of chronic rhinitis and is a year-round problem, often caused by indoor allergens, such as dust, animal dander, and pollens that may exist at the time. Treatment of chronic rhinitis and post nasal drip are dependent upon the type of rhinitis condition. The common cold (viral upper respiratory tract infection) is a contagious illness that may be caused by various viruses. Symptoms include a stuffy nose, headache, cough, sore throat, and maybe a fever. Antibiotics have no effect upon the common cold, and there is no evidence that zinc and vitamin C are effective treatments. COPD or chronic obstructive pulmonary disease is a lung condition caused by smoking tobacco, exposure to secondhand smoke, and/or air pollutants. Conditions that accompany COPD include chronic bronchitis, chronic cough, and emphysema. Symptoms of COPD include shortness of breath, wheezing, and chronic cough. Treatment of COPD include GOLD guidelines, smoking cessation, medications, and surgery. The life expectancy of a person with COPD depends on the stage of the disease. Boost your energy and combat COPD with these diet tips. Which foods can help patients with COPD? Which foods to avoid for COPD? 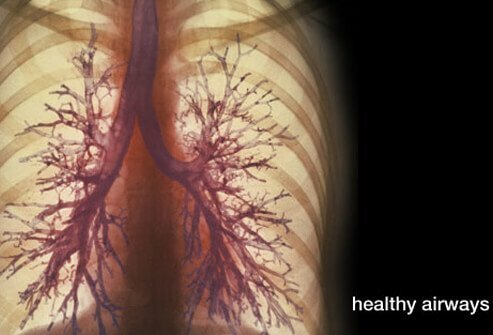 Learn more about how diet can affect lung health. COPD is a pulmonary disorder caused by obstructions in the airways of the lungs leading to breathing problems. Learn about COPD symptoms, diagnosis, and treatment options. COPD may be complicated by chronic bronchitis or emphysema. Viruses cause the common cold and the flu. Early symptoms and signs for a cold and the flu are similar, however, flu symptoms are typically more severe than cold symptoms. Cold and flu viruses are transmitted typically via coughing or sneezing. Feeling pressure or fullness on the left side of the abdomen where the spleen is located. Complications of a high red blood cell count include blood clots, heart attack, stroke, enlarged liver and spleen, angina (heart pain), AML leukemia, and heart failure. Blood clots in the liver or kidney can cause sudden, intense pain. Treatment goals for patients with polycythemia are to manage symptoms and reduce the risk of complications like heart attack and stroke. REFERENCE: NIH. National Heart, Lung, and Blood Institute. "What Causes Polycythemia Vera"? Updated: Mar 20, 2011. Natural and home remedies for sore throat symptoms and pain relief include essential oils, licorice gargles, slippery elm leaves, raw garlic, Throat Coat tea, sage, and acupuncture. Typical symptoms of a sore throat include throat pain, coughing, sneezing, fever, and swollen lymph nodes. Sore throats are caused by viral (common cold, flu, mumps), bacterial (tonsillitis, some STDs), toxins, allergens, trauma or injury, or "mechanical causes" (breathing through the mouth).